Monday morning entertainment at the Baird household involved a carbon calculation for the damage being inflicted upon the land next door to Eco-Sense. 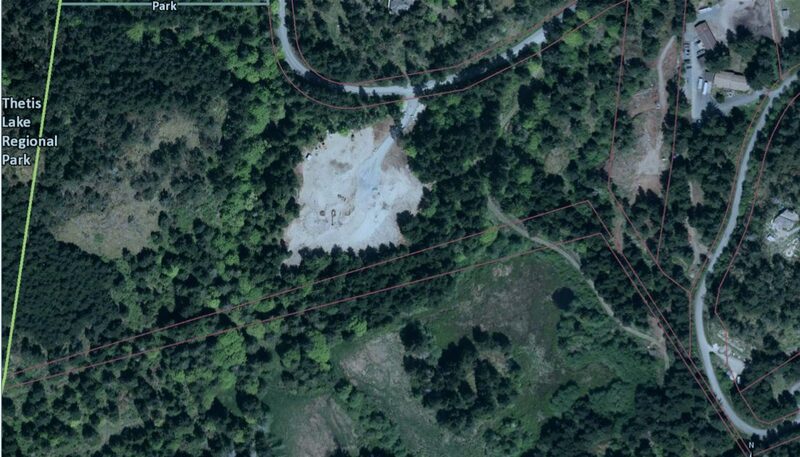 Over the past year, we have borne witness to the desecration of approximately 20 acres of forested land between our eco-sense home and Thetis Lakes Park. 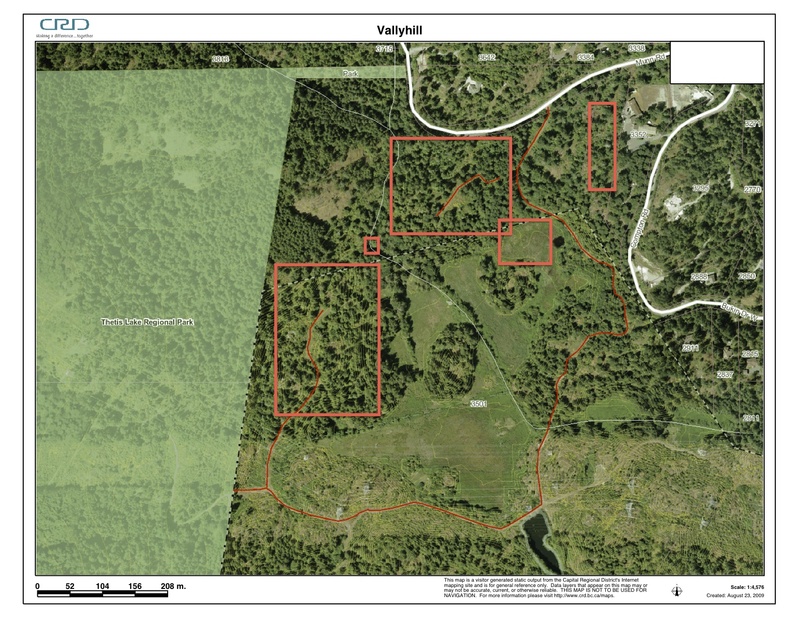 This large parcel of land is shared between two municipalities, Highlands and View Royal. Goodwin Farms as it states on the sign on Munn Road, is one of the original homesteads of the area. 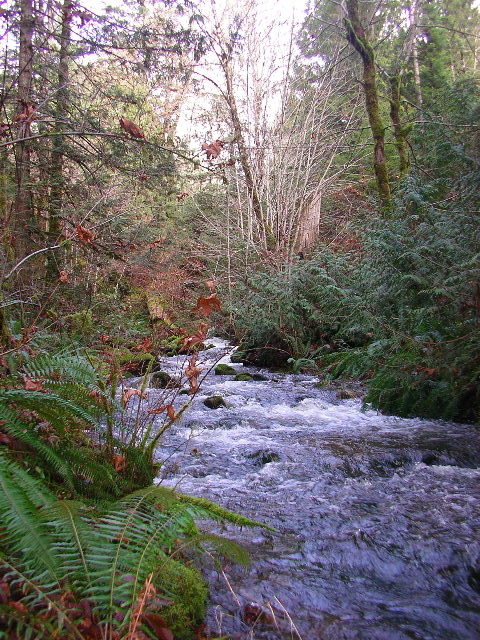 The land consists of many connected wetlands with some rocky outcrops, high bluffs backing onto Thetis Lakes Park, a beautiful creek, and various streams that feed the wetlands. For one year there have been diesel guzzling machines clearing the land, fires burning the life, and dumptrucks bringing in an estimated 10,000 loads of untested clay fill. 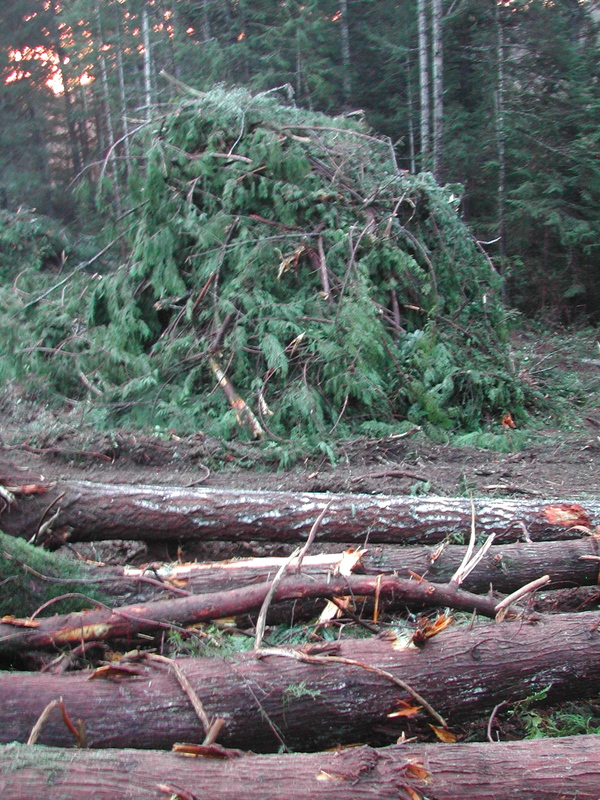 The damage started with the loss of approximately 10 acres of forest in the Highlands portion bordering Munn road (Feb 2011). The project then ventured into View Royal (Nov 2011) to clear cut another approx. 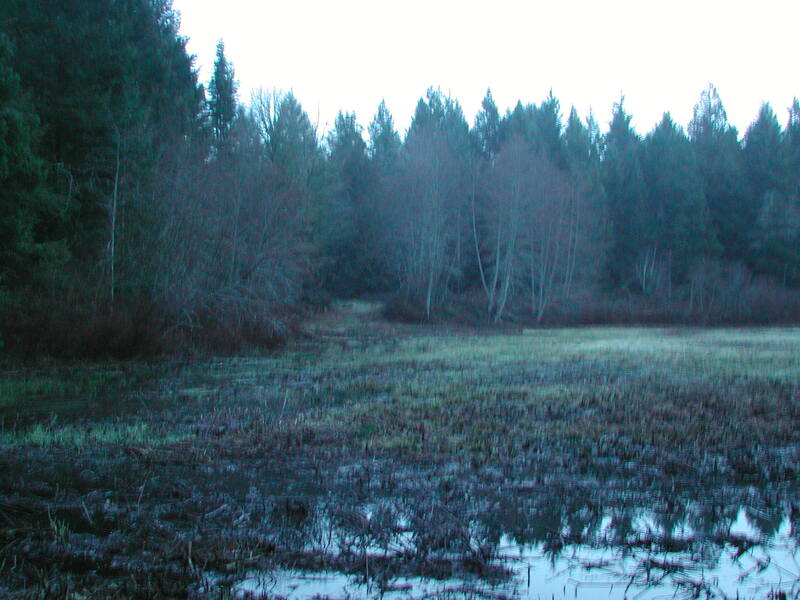 10 acres on the other side of the creek and wetland. Yesterday at dawn I ventured over to see what was really going on…and despite listening to excavators, dumptrucks, fires, and chainsaws for over a year, I was unprepared for the extent of damage to this spectacular wetland forest. (We had had phone conversation with the land owners over 3 years ago and had asked at that time if we could walk the land and were given the ok). As mentioned, approximately 20 acres have been decimated, but in addition to this, a wetland in View Royal, (across the street from our home), that was covered with wetlands shrubs 8-10 ft high has been mowed down and organics removed, and a bridge has been constructed over the creek in a riparian zone. Now, noise is one thing that we have had to deal with 7 days a week…listening to the crunching of forests, the grinding of excavators, the screaming of chainsaws, and the beeping of everything that goes into reverse. If this wasn’t bad enough, we have had to endure an enormous spike in rodent populations competing with us for our local organic food. We have lost entire crops to these displaced creatures and have attempted to cull the population with traps…sadly we have ended up killing as many song birds as we have rodents. We have however enjoyed the enormous new population in woodpeckers, owls, and hawks. 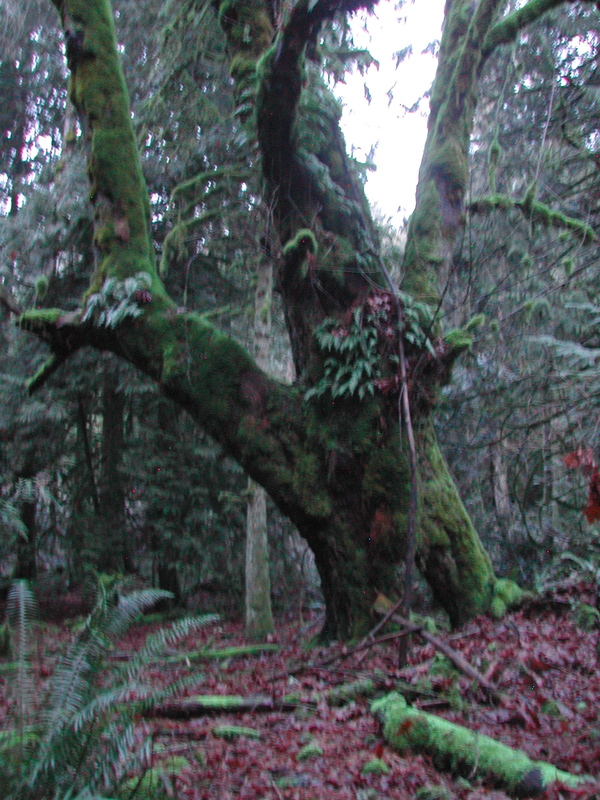 But the down side is that the woodpeckers are damaging many of our healthy douglas fir trees. Now, just when you think it can’t get worse…it does. About a month ago, our well water started to taste VERY metallic. It had been five years since we last tested, so of to the lab went a water sample. And guess what, it failed on three counts; coliforms, nitrates, and dissolved solids. As well , all the dissolved metals were higher that historical testing data…you know things like LEAD. Yummy! Today we are shocking the well and testing the water column depth. It would be difficult to prove what caused the failed test…even lack of rainfall this fall/early winter (possibly due to climate change) may have contributed. But, knowing what we know about ground water recharge and the importance of wetlands, it is not unreasonable to question the impacts of deforestation and untested and possibly contaminated fill deposit may have contributed to the quality of our most precious ground water. Here at Eco-Sense,we have made it our life’s work to live a low carbon lifestyle and to teach others about the benefits of such. Our individual carbon footprint is about 2.8 tonnes perperson (about the same as for the average German person) The world average is 4.5 tonnes. And get this, the average Canadian is 18.8 tonnes of CO2 per year. By now most people know that in order to avoid runaway climate change that will leave the planet uninhabitable to life as we know it, we ALL have to reduce our carbon footprints to zero in the next few decades. So, just for fun, we took some time this morning over coffee to calculate the carbon footprint of the activity next door on Goodwin Farms. We used various sources for our information. “The Climate Challenge; 101 Solutions to Global Warming” written by Guy Dauncey, is a well researched source of information. (In particular, check out chapter 1, with a photo of our house and family). We did an estimate on the number of dumptrucks, the concrete blocks, the crushed rocks, and the amount of diesel fuel used over this one year period following the Environment Agency carbon calculator. We were shocked at the the results…especially when combined with the loss of sequestered CO2 in the forest and soils. Total estimated CO2 for the damage to this land to date is 3869 tonnes for the materials and equipment and 3240 tonnes for the lost forest (8.1 ha at 400 t/ha). Total is 7109 tones of CO2…in one year. So get this, that would be the equivalent of 1580 world citizens carbon footprints or 2538 Eco-Sense citizens. For Canadians that would be 378 average Canadians carbon foot print per year. This is criminal. Why the hell are some people allowed to spew such excessive CO2 into the atmosphere while the rest of us work our asses off to reduce our ecological footprints? Our culture tells me that they must be 2539 % better and more important than me…and that every other living thing is NOT important. But even more importantly this illustrates how it is not the regular people causing the problem…sure we all need to do our part, BUT…it’s the wealthy elite that have the money. The top 10% of our population is causing the problem by means of the laws that we the majority (the 90%) have control of. We can change the laws if we stop allowing the money and power to destabilize our climate and destroy our ecosystems. So, while 90% of us bust our butts to reduce our carbon footprints (as we should), and give up our airflights and reduce our driving, the carbon emissions continue to soar. The top 10% who control the media, the message, the sheeple (sheep people), have actually convinced us that we are the problem. The entire Highland’s population (2000 people) would have to cut their carbon emissions by 3.5 tonnes to offset what has just happened on this land…then there’s all the other such equally devastating projects currently occurring in the Highlands. Pretty soon, none of us could have a carbon footprint if we were to truly offset what the top 10% are emitting into the atmosphere. See table. We know what needs to be done. We need a price on carbon (provincial and municipal level) and we need to take personhood rights away from the corporation and give rights to nature (I have heard that this can be done at the municipal level). Why the hell do our laws allow these people to commit ecocide on this land and impact all generations of people and species that occupy this part of Vancouver island now and for many hundreds of years into the future…if there even is a future for the earths species…and the science is telling us that that is becoming increasingly UNLIKELY. Listen to Gwen Dyer on CBC IDEAS with Paul Kennedy. So it gets worse…The damage may only be getting started and there are all kinds of rumours flying about what may be the plan for that land. The official line is that they are building a barn and pasture land. Unofficially I have heard that Fort Victoria may like to move to the Highlands so that they can develop that much more valuable land where the RV park currently sits. Great! An RV park next door to Eco-Sense. So for now, I’ll grab my bottled water (since I can’t drink mine), a snack of imported veggies (since the rats ate mine), and try to find some sanity on a hike…now if I could only find some quiet natural place to go for a hike. Just think…we’ve got it good compared to what our kids are facing. “Sorry” seems like such a wet-noodle word for the searing your souls are being exposed to but I am so sorry that everything you are fighting against seems to be happening right next door. Knowing you two, you’ve likely investigated anything that you(supported by your many friends) could do to stop the destruction, barring jail time of course. (If you see any nuclear waste or toxic site signs you might want to post one with an arrow on it pointing next door.) So, the next step is to take care of yourselves and find something to salve the wounds. Hiking sounds like a good idea- maybe a walk on a beach. well – it is a potent contrast . Perhaps you can use this contrast between you and your neighbour to the collective advantage – not to divide members of the same community, but to offer an obvious illustration of the contrast – to inspire the collective in your neighbourhood and beyond your neighbourhood. If you can do so without alienating yourselves from each other, then that is much better. In the long run, identifying a neighbour as “the enemy” will only serve to attract further negativity, which will not serve you or the collective in the long run. Hi Christine…yup, you are right of course…but we have to let the pain we feel at the loss of this chunk of life settle in. For me, nature is my artwork…I find it stunningly beautiful and when someone comes into my cathedral with a sludge hammer and starts destroying what I love…I get very angry. I feel like I am the powerless victim with no means to stop the abuse. Everyone talks about the sense of place…my sense of place extends to the habitat where I live…it does not end on the piece of land with arbitrary boundaries that carries an arbitrary title with my name on it. Who are these people? Who owns that land, and is making these anti-Earth decisions. Let the world know who they are, where they shop, where they bank! Post pics on line of all the nasty stuff they’re doing. You don’t have to be mean, just observant and share. My other comments are best shared off-line. Best! Hi Ann and Gord, I came on a tour of your home in 2008. Fantastic place. After reading your post here, and the frustration of the 90%, or the 99%, or whatever, I can emphasize with you. While I don’t have the same scale of problem you do so close, I have my own battle which I’m sure many others face to. I have an organized and detailed recycling system at my house, and work, where I even collect the styrofoam plates used by my coworkers, and recycle them at my expense at Pacific Mobile Depot. I hate seeing things thrown out. I’ve turned my weekly garbage bag into a monthly garbage bag, and I still don’t think that’s good enough. This is then completely cancelled out by just the people living in the same house as me, who have small children, and refuse to contribute because it takes too much time out of their day. Everything used by their kids goes to waste. I wish I had something positive to contribute, and this may be off-topic, but I’ve basically decided to just not have kids. The world they are coming into so far has nothing to look forward to with such blatant and pointless destruction as shown by your new neighbors. If every person in North America built an eco-sense house this year and stopped driving cars, the developing world would cancel that out ten times easy. Ann and Gord, we are so sad for you today. While it will be very difficult to prove if its even possible (in business we’re dealing with one of these cases right now), it is evident that you and your neighbours are being affected by this destruction. Our hearts go out to you. We too are faced with a neighbour who likes to destroy and trash…discarding garbage including oil residue into “their” yard, which of course is at “our yard”. It is likely the developer is well within their legal rights. The SARA act for protection of species is not policed and as such remains useless. Our laws have failed us and failed the planet. We’re with you in believing that land should be stewarded and not owned, that each of us has a responsibility to this earth and its creatures. That we must value and respect life and acknowledge that all is interwoven and precious in its own right. We, as a culture, haven’t quite incorporated these values yet into our societal memes. But I remain hopeful. Keep telling your story. But ask people you connect with to DO SOMETHING… perhaps a petition to Highland Council? Let us know how we can make a difference in your good fight. What do you think that says for us as a society when we have to petition the government for them to obey the laws they created?